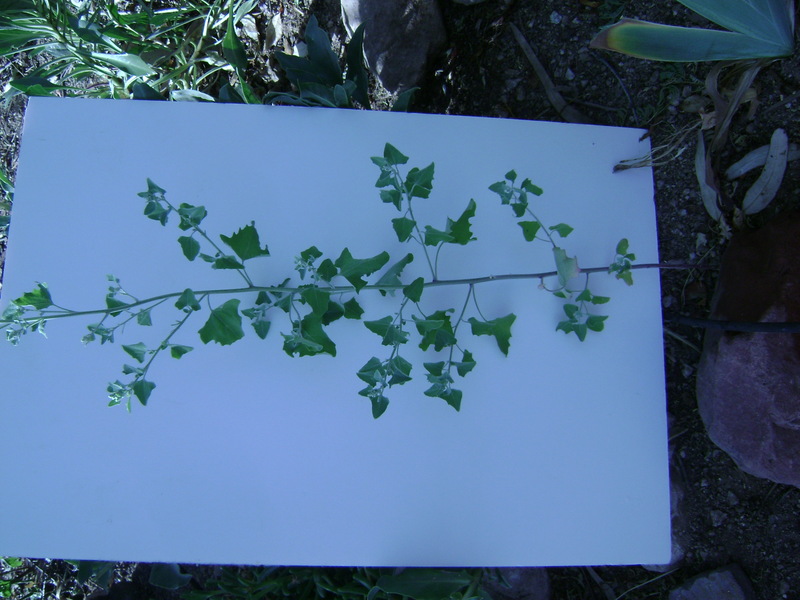 I’m rushing to get ready for a demonstration in the culinary tent at Tucson Festival of Books tomorrow, but noticed this lamb’s-quarter (Chenopodium berlandieri or fremontii) growing like crazy in my yard. This is one of the tastiest of the spring greens. It shows up in March and April in desert areas, but I’ve seen it as late as July in Prescott which is a mile high. It is sometimes called goosefoot because the shape of the leaves (closeup at the bottom) looks the the footprint a goose might make in a muddy barnyard. Because of its abundance and mild flavor, lamb’s-quarter is one of the most popular wild foods gathered not just in the West but also throughout the country. When gathering, cloose plants less than one foot tall or use the new shoots of older plants. The stems can be tough, so discard them after you have picked off the succulent leaves. Steam the leaves by placing them in a pot with a tightly fitting lid, add a tablespoon or two of water and cook over low heat for about five minutes. A little butter and maybe a dash of chile is all the seasoning it needs. Lamb’s-quarter is loaded with nutrition — a cup of cooked greens provides about as much calcium as a cup of cow’s milk and more vitamin A than a serving of spinach. You can use it in any recipes where you would use spinach, or check out the recipes for greens in my book Cooking the Wild Southwest: Delicious Recipes for Desert Plants. Can you see the goosefoot? To show how highly the Goosefoot is regarded in some parts, there’s even a 5-star Restaurant called Goosefoot in Chicago! 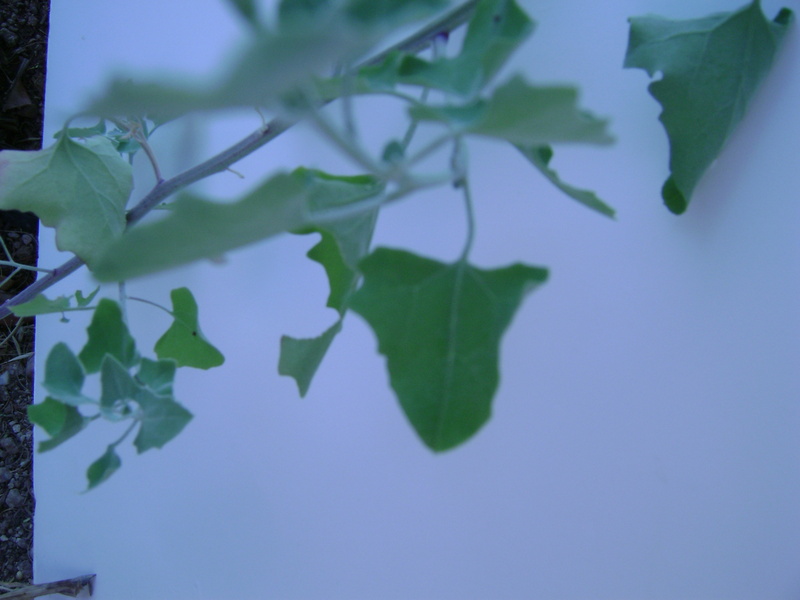 A $50 dinner, it seems without so much of a sprig of Goosefoot. I haven’t given tours in years but there has been some interest lately so maybe I’ll start again. As for the peppergrass, it is pretty easy to recognize. Its size seems to depend on how much water it gets — I saw a tiny one three inches tall on a brick median and some 18 inches tall next to Sabino Creek. But typically they are about six to eight inches tall. The seeds are flat, green and tiny, just one-eighth inch across, much smaller than a pencil eraser. Pluck one off and taste it — if it is sharp and peppery you’ve got the right thing.